Staging is more popular than ever when it comes to selling a home. 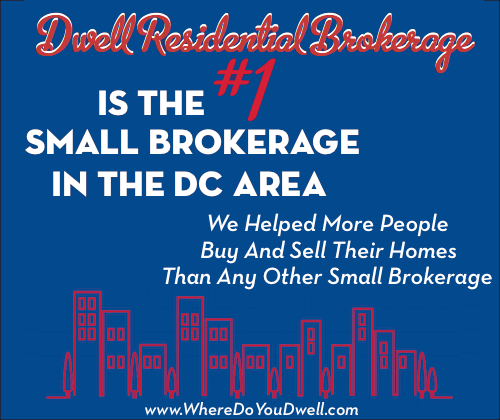 But, you might wonder if it’s really worth the inconvenience and upfront costs for you, especially if it’s more of a seller’s market. Even with a well-maintained (and well-decorated) home, staging can increase the price you end up getting for your home and decrease the time it stays on the market. It’s an investment that will reap rewards … trust us! You’ll be pleased with the offers you get on your home. Staging a home is not like “cleaning your home for guests” but rather it entails coming up with a marketing strategy that will showcase your home at its best for current buyers. You still need to make it sparkle and shine by cleaning but it’s this next step that makes selling your home more of a “business” goal that has a clear-cut purpose. How you live is NOT how you sell! For example, that third bedroom that is part office, part storage closet? That probably needs to be turned into an actual bedroom. It can be really easy to do with a blow up mattress and some inexpensive, yet stylish bedding from a discount store. Take a look around your home to see where you can improve a room or a certain unused (or misused) space. Strategic but inexpensive staging can make it more appealing to your target buyer. Staging creates a positive emotional tug for buyers when they walk through your door. First impressions are so important and will linger after buyers leave your home. You want them dreaming of their perfect life in your home. That’s why you need to do some decluttering, sprucing up, reorganizing, and storing certain items out of sight. By doing this, buyers won’t get distracted looking at your life and belongings. They can start to think more with their emotions and how it feels to live their life in this home. This staging can be easy and cost just about nothing. We can walk each room with you to tell you exactly what to put where and what to put away. And, if you have already moved and your home is empty, then staging can really help set the tone of your home and be a much needed emotional tug. Sometimes all it takes is a fresh eye. Your large leather couch or collection of pottery may be gorgeous and look great for your day-to day-life, but to buyers it could mean your home feels tight and cluttered. Remember, don’t take it personally! When you are selling your home, it’s a product for sale, not the home you’ll be living in any more. Keep reminding yourself that and maintain that mindset when your home is listed. Your personal touches and well-loved items are a reflection of you, and that’s not what you are selling. You want the buyers to see themselves in your home. You may love that turquoise wall, but most buyers will be distracted and only see the wall and not the spacious room and everything else your home has to offer. Try to neutralize your home. Right now, the best colors are the whitest white for doors, trim and ceilings, and a light pumice grey for the walls. You want a calming, soothing, modern, and clean slate for new buyers to imagine their life in. Staging can give a room a purpose … create an office, a guest room, a reading nook that usually isn’t there. You don’t want buyers to wonder what they can use this room or space for while living there. Instead, you want to show them what life could be like there, even if it’s not currently the way you are using the space. Think about who the ultimate buyer of your home will be and cater to how THEY would use the rooms in your home and stage accordingly. Take what you have and work with it by paring down, rearranging or relocating furniture and artwork, and also reconsider paint colors. Prioritize a list of things you could do and then decide what you’ll do and what you won’t do based on your budget. If it’s in your budget, you can always choose to work with a professional stager that will bring in items to make your home look the “right” way for your target buyer. Estimates are usually free. Remember, you can take it or leave it since it’s your home for sale. A carefully staged home looks more desirable in online photos. Your online presence can either encourage buyers to check out your home or could drive them away. Each room needs to look like it has a purpose and is ready to move right into. This will get you more people coming to look at the house, and the more people who come and see it means more offers and a higher contract price. 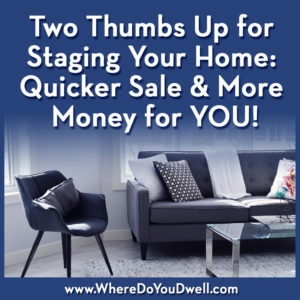 Staging can help you sell it quicker and for more money. It usually is worth the effort and initial expense to stage your home. Furthermore, according to the Real Estate Staging Association, homes that are staged before going on the market sell 73% faster, on average, than their non-staged counterparts. So investing a few hundred dollars upfront could yield thousands of dollars for your sale price! Call us today if you have any questions about staging. We would be happy to help you with how best to stage your home with what you have and what we can bring over to help you. We can also discuss if it’s worth the investment to hire a professional. The answer may surprise you!